Please help us to help you by supplying the following information on your enquiry, we need sizes and quantities to be able to quote and the detail affects the accuracy of the prices quoted, so please take time to fill in. The method of production of your job is chosen according to the quantity and size of the item required e.g. short run jobs are produced digitally which requires no cutting forms or plates, longer runs printed Litho, screen, or Flexo with automatic die-cutting which requires cutting forms. We can produce large items in house on our digital printing and cutting unit for small to medium runs. Correct sizing detail is essential for us to give a price to produce your job. We can work with either the size of the pack or unit you require, or if it is easier you can give us the dimensions of your item and an idea of how you want it packed or displayed and we can go from there. We must have potential order quantities to be able to produce a price for you. We have no minimum order quantity and our production is able to competitively do both short and long runs, however most of the products we sell require several set up operations making short numbers more expensive. We can easily quote for a range of numbers but do need that information to start with. 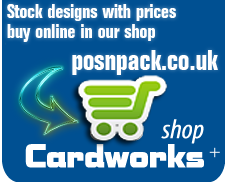 Where did you hear about Cardworks?